We advise you fully in all matters relating to your medical device - legal, technical and economical - during all stages of the product life cycle. At the beginning we conduct a classic feasibility study: Is your project feasible and at what cost? What market opportunities does your idea have and what are the risks? We advise you in an unbiased manner, including in cases where you need a second opinion to an already running project. When developing medical devices, processes and methods as well as the conditions of approval must be taken into account from the start. Therefore, our advice on these aspects becomes an integral part of your project. With the strategic planning of product certification and approval, we pave the way for your success. During development, we take over the technical documentation of your medical device and the verification. We bring unplanned changes that may arise during development quickly into the regulatory framework. If the regulations themselves change, we advise you on necessary adaptions. All our customers - whether they are corporations, medium-sized companies or start-ups - benefit from our expertise in the highly complex field of international approval. We help you with procedures such as CE, CB, 510(k), PMA, De Novo or with CFDA requirements and competently accompany you with your risk analysis. Even after the product is placed on the market, you can rely on our continued support. We create GAP analyzes and develop cost-optimization concepts. We advise you on the need for a re-design when technologies or the legal framework change. 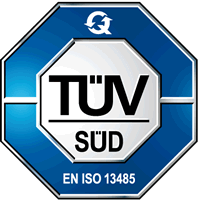 "Whenever we advise our customers on standards and guidelines, we make sure that they are always on the safe side - not only legally, but also practically." Benefit from our years of experience in developing, producing and certifying of active medical devices. Over time, we have acquired a broad spectrum of specialist knowledge so that we can competently help you succeed. Provide knowledge of international marketing strategies (e.g., USA, Canada, China, Brazil, etc. ).